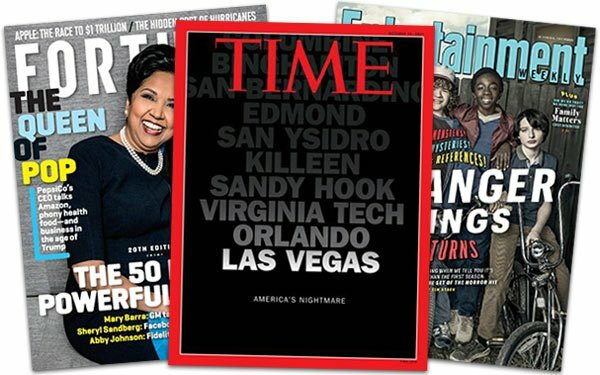 Time Inc. is reducing the circulation and frequency of a number of its titles to “sustain its print business,” focusing on its core readership with heftier issues. The goal is to attract advertisers to a more valuable audience. Time Inc. confirmed to Publishers Daily it will cut the circulation of Time and People en Español, as well as reduce the frequency of the latter, Sports Illustrated, Fortune, Money and Entertainment Weekly. Time magazine will cut its circulation by one-third, from 3 million to 2 million per issue. Its frequency will stay the same at 44 issues per year. People en Español will lower its circulation from 540,000 to 500,000 and cut two of its issues to print nine a year. Sports Illustrated will drop from 38 issues a year to 27. Fortune’s frequency will change to monthly, from 16 issues a year. Money will drop to 10 issues from 11. Entertainment Weekly will cut four issues and appear 34 times a year in 2018. The publisher is currently in the midst of a transformation with its brands. According to a recent regulatory filing from its U.S. headquarters, Time Inc. may sell its Essence, Sunset and Golf titles, as well as its British publishing division. The New York Post reports the frequency will drop for two of those titles, too. Essence will cut two issues to print 10 a year, and Sunset will drop to 11 issues in 2018 from its current 12. Time Inc. has been hit with declines in advertising and circulation revenues. Total revenues fell 10% from $769 million in the second quarter of 2016 to $694 million in the second quarter of 2017. Ad revenues were down 12% to $374 million, largely due to the decline in print advertising. Circulation also fell 12% to $207 million. In August, the publisher announced a plan to cut costs by $400 million across the company.